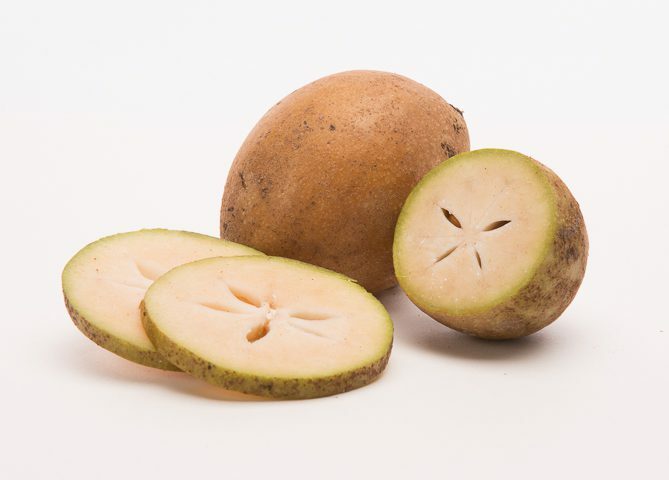 Sapote or Sapodilla fruit is a berry, round or oval measuring about 10 cm in diameter and weigh about 150g. 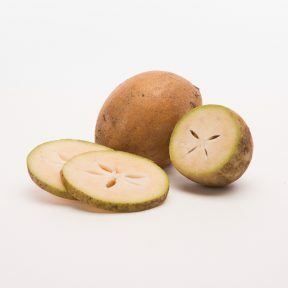 Sapote has grey/brown sandy outer surface, once ripen, it becomes soft, acquiring a sweet taste and smooth or grainy texture with slight musky flavor. Names: Sapodilla, Sapote, Chico sapote, Zapote Chico, Chikoo, Zapotillo, Nispero. Source: South Florida, Native to Southern Mexico, Central America & the Caribbean. Handling: Once ripen, the fruit yields to gentle thumb pressure. Mature but unripe fruits must be kept at room temperature for 7 to 10 days to ripen. Firm, ripe sapodillas can keep well for several days inside the home refrigerator. Varieties: Brown Sugar, Alano, Hasya, Makok, Morena, Tikal.